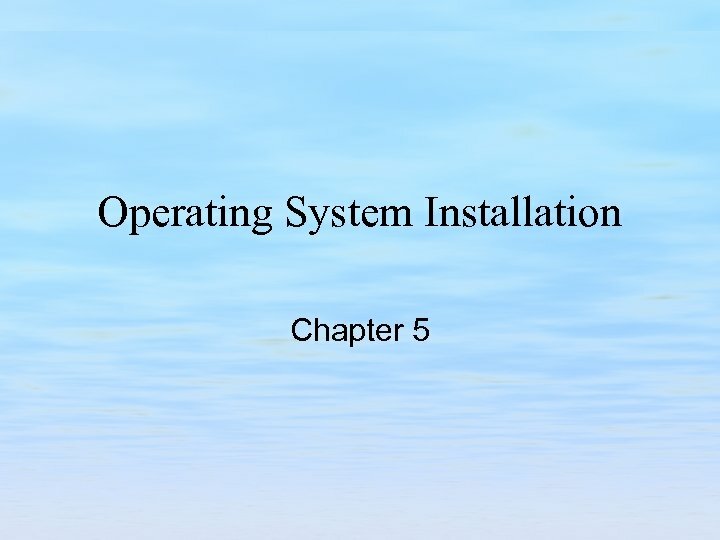 Chapter Objectives • Explore the hardware and software prerequisites for OS installation. • Explore steps that must be taken before installing or upgrading an OS. • Explore methods of producing robust reproducible OS installations. • Explore installation types and techniques. Installing an Operating System • Hardware Requirements – Before you attempt to install an OS on a machine, it would be wise to ensure that the OS in question runs on the hardware that you have available. 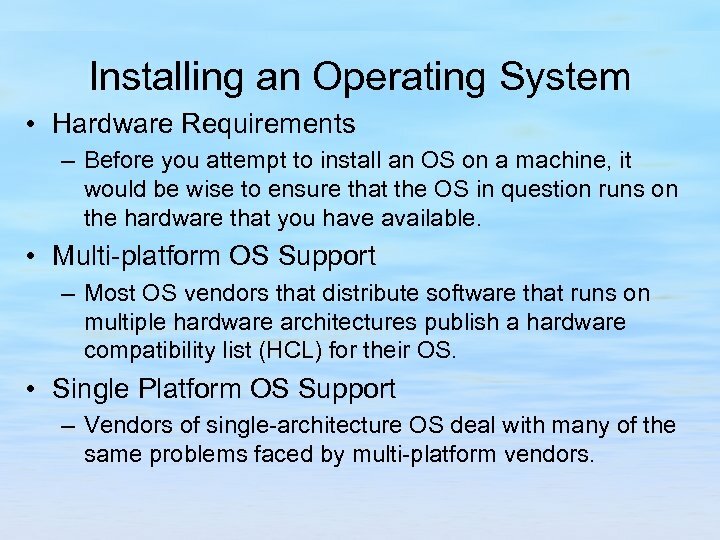 • Multi-platform OS Support – Most OS vendors that distribute software that runs on multiple hardware architectures publish a hardware compatibility list (HCL) for their OS. • Single Platform OS Support – Vendors of single-architecture OS deal with many of the same problems faced by multi-platform vendors. 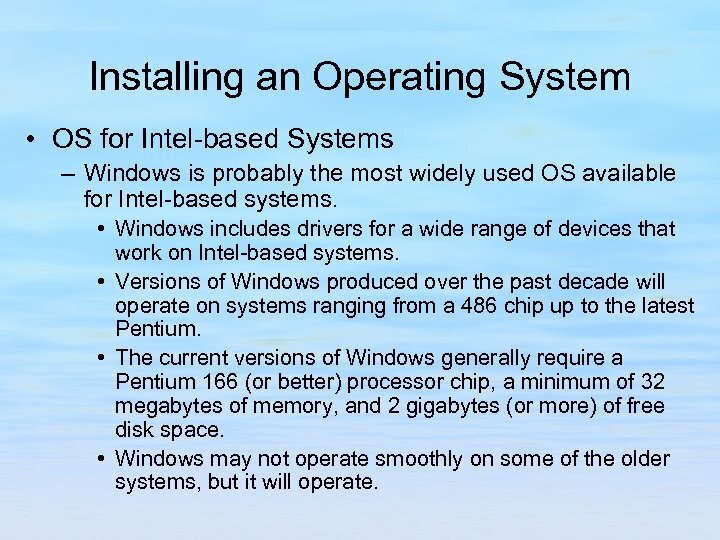 Installing an Operating System • OS for Intel-based Systems – Windows is probably the most widely used OS available for Intel-based systems. • Windows includes drivers for a wide range of devices that work on Intel-based systems. • Versions of Windows produced over the past decade will operate on systems ranging from a 486 chip up to the latest Pentium. • The current versions of Windows generally require a Pentium 166 (or better) processor chip, a minimum of 32 megabytes of memory, and 2 gigabytes (or more) of free disk space. • Windows may not operate smoothly on some of the older systems, but it will operate. Installing an Operating System • OS for Intel-based Systems – Recent releases of Linux are beginning to nip at the heels of Windows in regard to device driver availability, and the number of systems running the OS. • The open-source movement has the advantage of allowing anyone to submit a device driver for their favorite device. – Because there are so many PC systems available, many people know how to write “bad” software for the PC architecture. • This plethora of untested/unsupported software available for the system can lead to security and reliability problems. • Both Linux, and Windows suffer because of this situation! 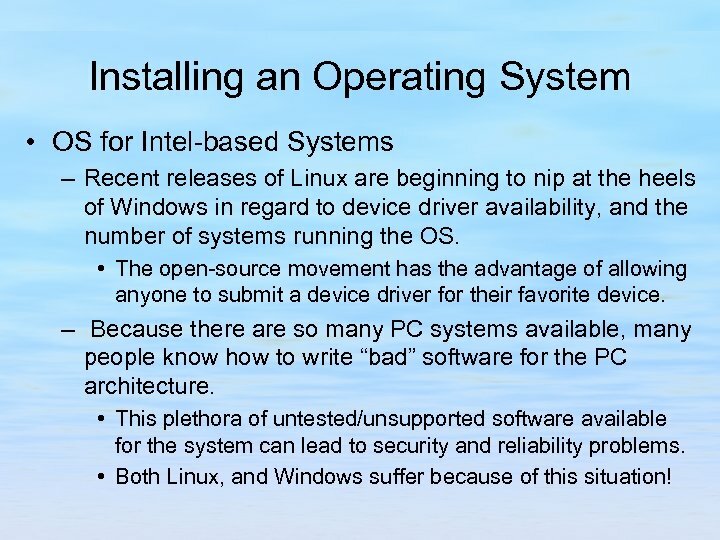 Installing an Operating System • OS for Intel-based Systems – Well behind Windows and Linux, BSD, and Solaris are also available for Intel architecture systems. • Solaris suffers from a lack of device drivers for the latest/greatest devices. • Solaris also often does not offer device drivers for very old devices. • Sun discontinued support for the Solaris Intel edition with the release of Solaris 9. They now offer a Linux “solution” in place of Solaris for Intel. • BSD variants are generally more secure than the competitors, and offer very robust/well tested code, but they have not caught on as general purpose offerings. BSD is often found in research labs, and under the hood of network “appliances” such as firewalls. Installing an Operating System • OS for Non Intel-based Systems • Proprietary hardware architectures may not allow you to run more than one OS. – The “single offering” case greatly simplifies the decision regarding which OS you should load on the machine! – The single OS is also easier for the vendor to support, as the service personnel only have one system to learn. – Single-OS systems are also likely to be replaced by multi. OS systems over time. • The world of computing is not a “one-size-fits-all” environment! • The UNIX vs. Windows war will be battled for many years. 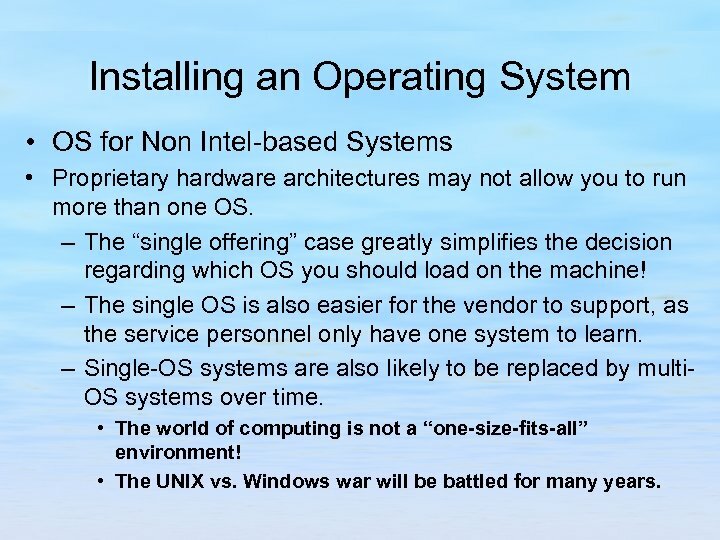 Installing an Operating System • OS for Non Intel-based Systems – Whereas some architectures may only work with one OS, others are blessed with multiple fully supported OS. • Some vendors may provide full support for their proprietary OS but partial support for a second OS. • More often than not, the second OS is one of the Linux distributions. • Vendors such as Hewlett-Packard, IBM, Compaq and others now offer multiple OS for their hardware. • Other vendors (like Sun) offer a line of Intel based Linux systems, as well as the SPARC based systems. Installing an Operating System • OS for Non Intel-based Systems – Other hardware vendors only support their proprietary OS on their hardware. 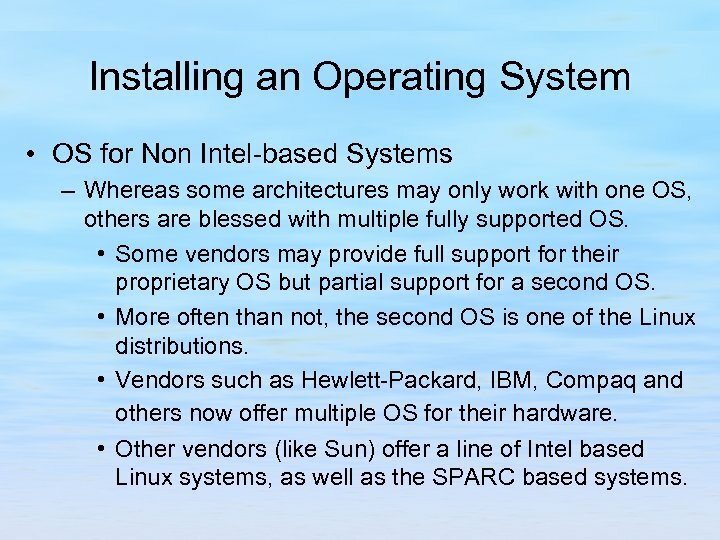 • This is true for Sun Microsystems, even though there are Linux distributions that support the SPARC architecture. – Although Linux is available for SPARC systems, many software vendors do not port their applications for the Linux/SPARC market. 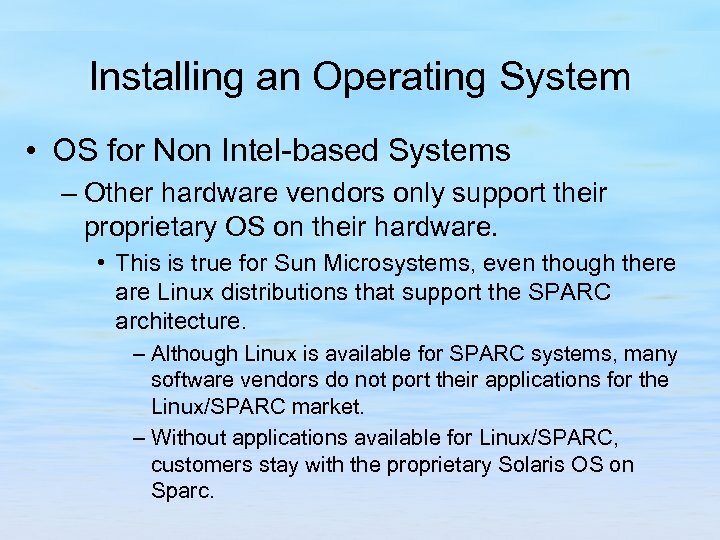 – Without applications available for Linux/SPARC, customers stay with the proprietary Solaris OS on Sparc. 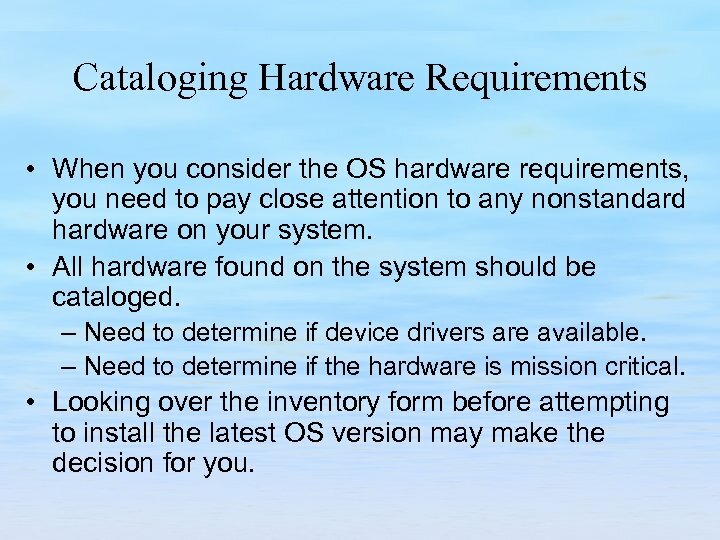 Cataloging Hardware Requirements • When you consider the OS hardware requirements, you need to pay close attention to any nonstandard hardware on your system. • All hardware found on the system should be cataloged. – Need to determine if device drivers are available. – Need to determine if the hardware is mission critical. • Looking over the inventory form before attempting to install the latest OS version may make the decision for you. Cataloging Hardware Requirements • PC systems typically force a few more restraints on the system hardware than other architectures. – For example, an Intel system requires a VGA display and keyboard in order to boot. • Unfortunately, there are hundreds of display adapters, thousands of keyboards, and tens of thousands of mice available for PCs of different heritage. • OS designers also impose restraints on the system hardware. – Software kernel architectures may impose specific revisionlevel requirements on the hardware. 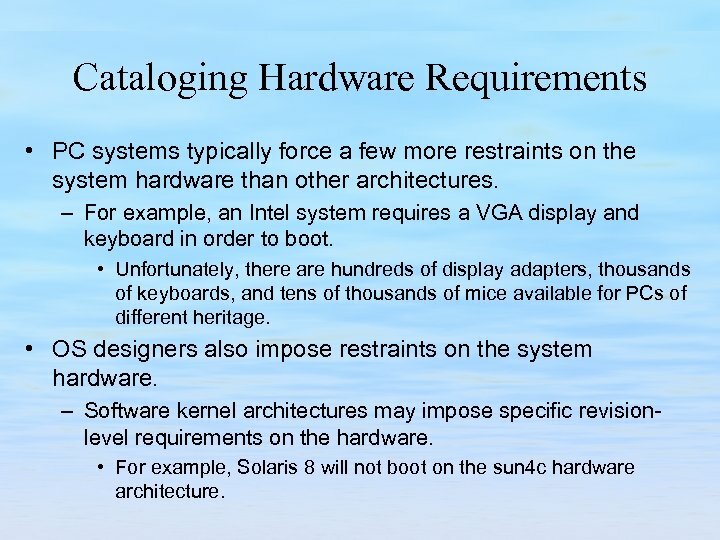 • For example, Solaris 8 will not boot on the sun 4 c hardware architecture. Installation Time Requirements – When it comes to a discussion of installing an OS, the answer to “what hardware do I need? ” is almost as nebulous as the answer to “how long will it take? ” – When everything goes right, a full OS install might take an hour. But when things go wrong, you might be looking at eight or more hours to get the OS installed and working. 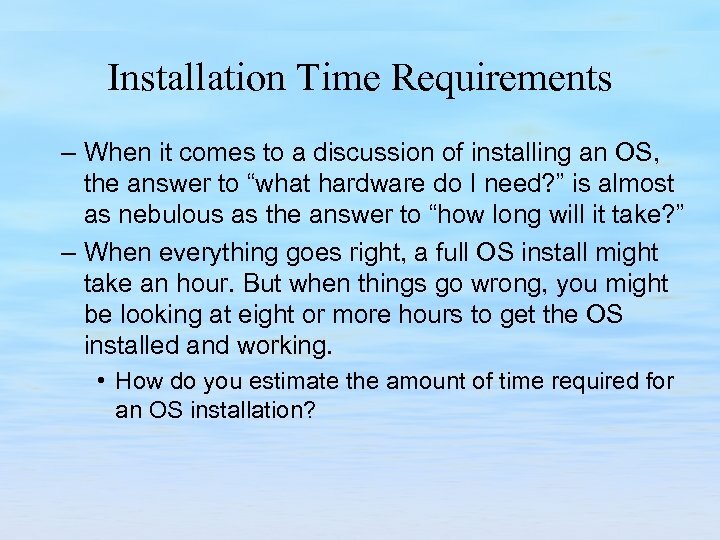 • How do you estimate the amount of time required for an OS installation? 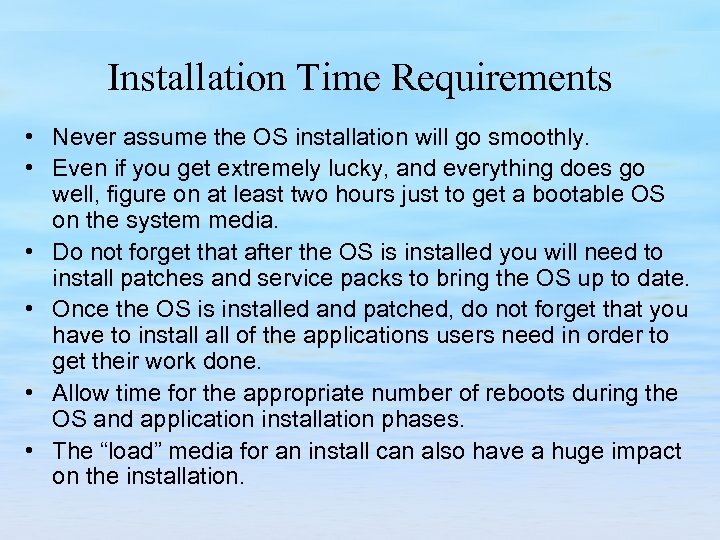 Installation Time Requirements • Never assume the OS installation will go smoothly. • Even if you get extremely lucky, and everything does go well, figure on at least two hours just to get a bootable OS on the system media. • Do not forget that after the OS is installed you will need to install patches and service packs to bring the OS up to date. • Once the OS is installed and patched, do not forget that you have to install of the applications users need in order to get their work done. • Allow time for the appropriate number of reboots during the OS and application installation phases. • The “load” media for an install can also have a huge impact on the installation. 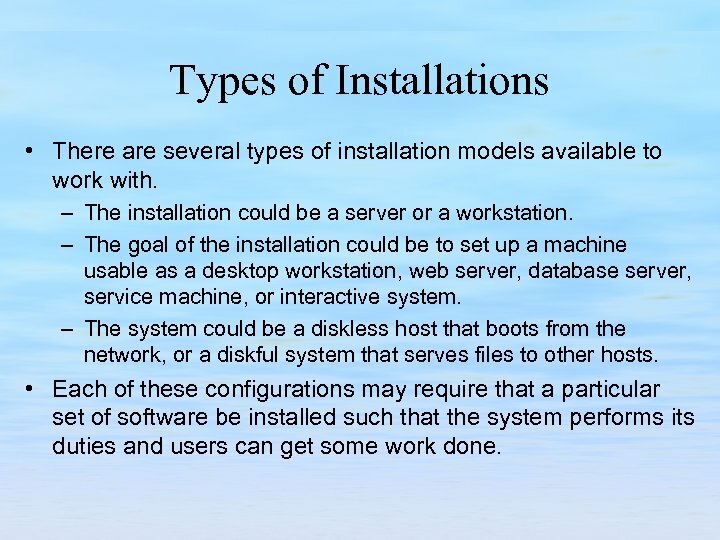 Types of Installations • There are several types of installation models available to work with. – The installation could be a server or a workstation. – The goal of the installation could be to set up a machine usable as a desktop workstation, web server, database server, service machine, or interactive system. – The system could be a diskless host that boots from the network, or a diskful system that serves files to other hosts. • Each of these configurations may require that a particular set of software be installed such that the system performs its duties and users can get some work done. 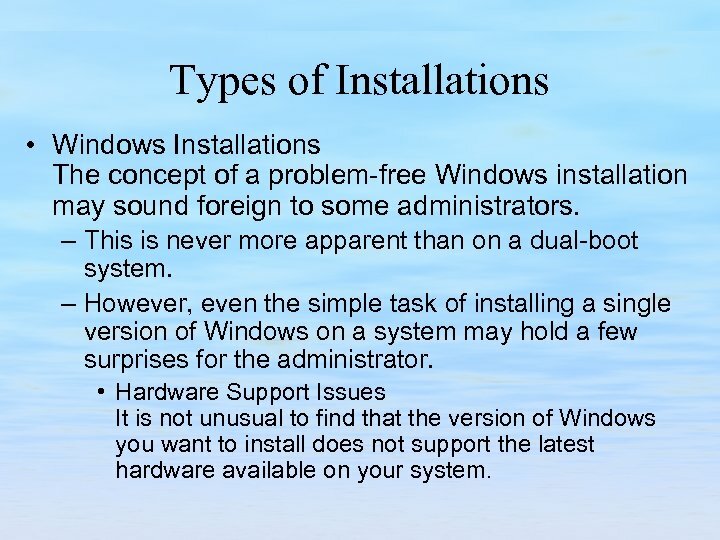 Types of Installations • Windows Installations The concept of a problem-free Windows installation may sound foreign to some administrators. – This is never more apparent than on a dual-boot system. – However, even the simple task of installing a single version of Windows on a system may hold a few surprises for the administrator. • Hardware Support Issues It is not unusual to find that the version of Windows you want to install does not support the latest hardware available on your system. 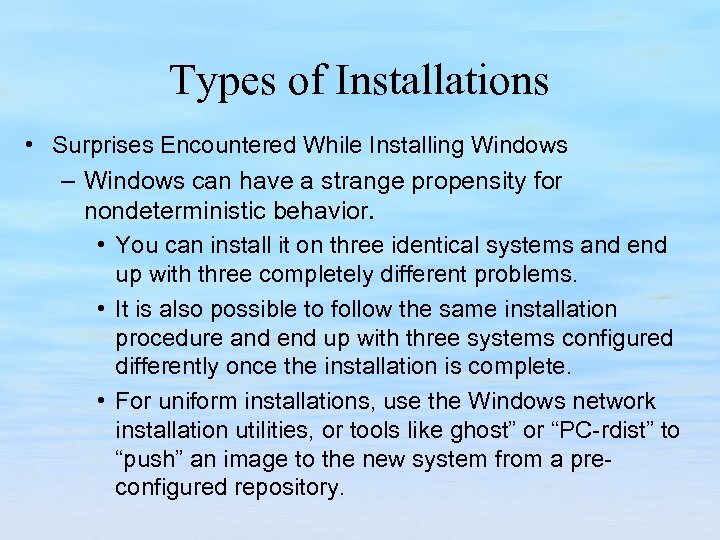 Types of Installations • Surprises Encountered While Installing Windows – Windows can have a strange propensity for nondeterministic behavior. • You can install it on three identical systems and end up with three completely different problems. • It is also possible to follow the same installation procedure and end up with three systems configured differently once the installation is complete. • For uniform installations, use the Windows network installation utilities, or tools like ghost” or “PC-rdist” to “push” an image to the new system from a preconfigured repository. 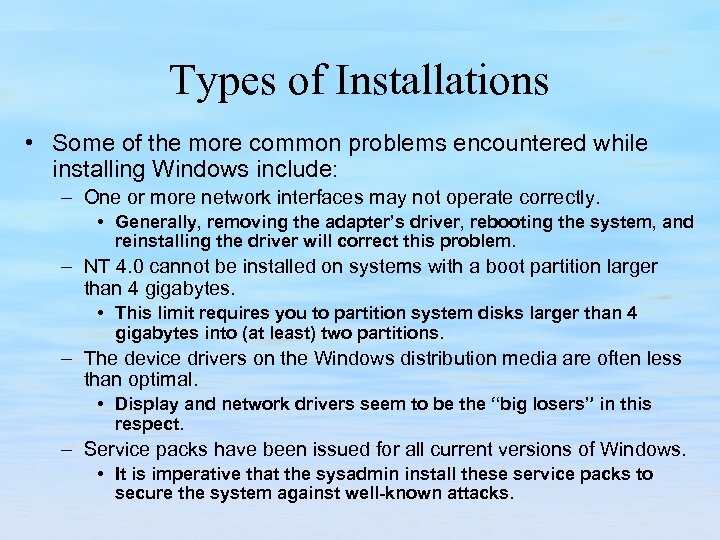 Types of Installations • Some of the more common problems encountered while installing Windows include: – One or more network interfaces may not operate correctly. • Generally, removing the adapter’s driver, rebooting the system, and reinstalling the driver will correct this problem. – NT 4. 0 cannot be installed on systems with a boot partition larger than 4 gigabytes. • This limit requires you to partition system disks larger than 4 gigabytes into (at least) two partitions. – The device drivers on the Windows distribution media are often less than optimal. • Display and network drivers seem to be the “big losers” in this respect. – Service packs have been issued for all current versions of Windows. • It is imperative that the sysadmin install these service packs to secure the system against well-known attacks. Types of Installations • Dual-boot Windows Installations The idea behind a dual-boot system is to install two different OS on the bootable medium. – This allows the user to run either system, which hopefully allows the user more flexibility in performing tasks. – Unfortunately, creating a dual-boot system is a lot more difficult than it should be, and many times Windows seems to be in the middle of the problems. 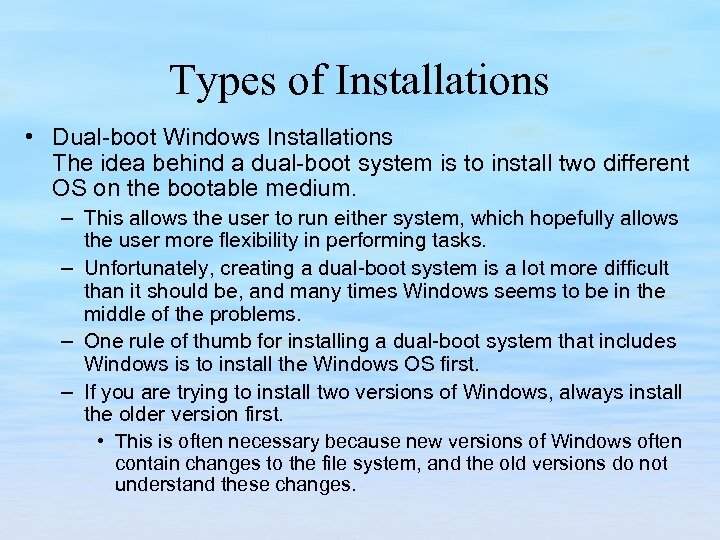 – One rule of thumb for installing a dual-boot system that includes Windows is to install the Windows OS first. – If you are trying to install two versions of Windows, always install the older version first. • This is often necessary because new versions of Windows often contain changes to the file system, and the old versions do not understand these changes. 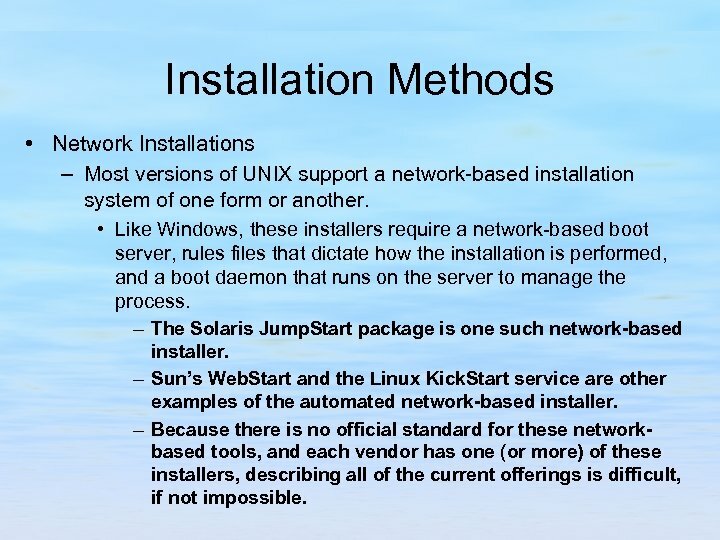 Types of Installations • Other Installations – Installing a Solaris/Linux dual-boot Intel system often presents problems for the administrator. • The Solaris Intel installer limits the number of partitions allowed on a disk where Solaris will be installed. – If the disk has more than three partitions, and/or the installation of Solaris would cause the disk to have more than three partitions, the installation will fail. • Linux wants a boot partition, and a kernel partition (minimum). • Solaris also wants a boot partition and a kernel partition. 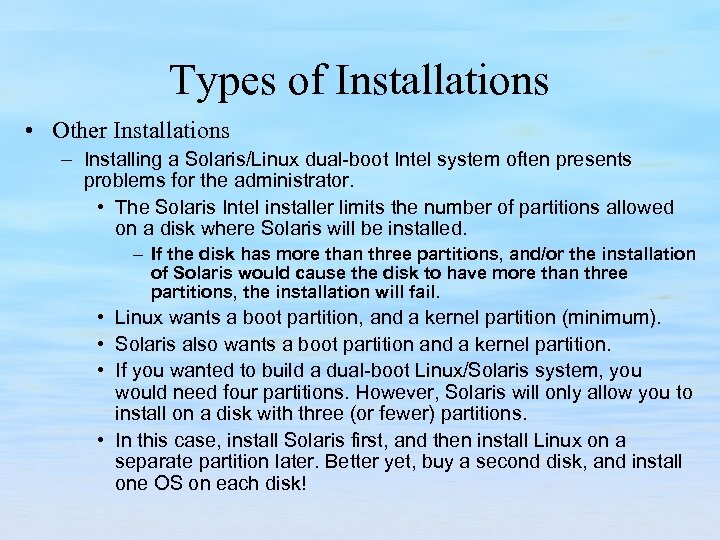 • If you wanted to build a dual-boot Linux/Solaris system, you would need four partitions. However, Solaris will only allow you to install on a disk with three (or fewer) partitions. • In this case, install Solaris first, and then install Linux on a separate partition later. Better yet, buy a second disk, and install one OS on each disk! 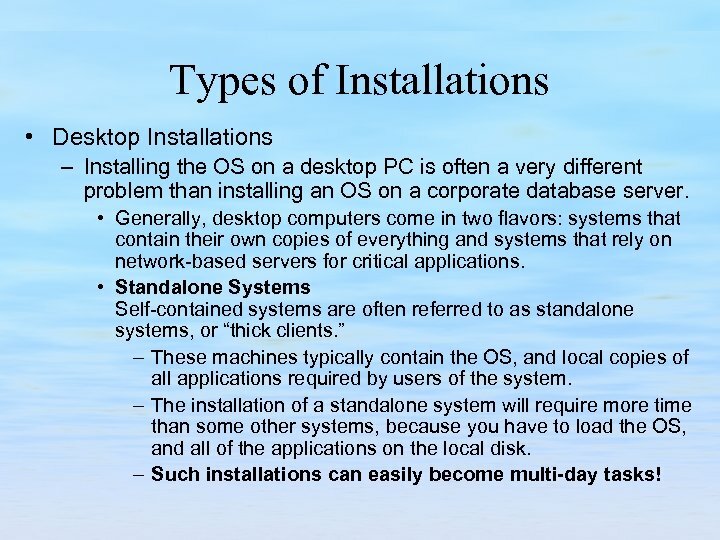 Types of Installations • Desktop Installations – Installing the OS on a desktop PC is often a very different problem than installing an OS on a corporate database server. • Generally, desktop computers come in two flavors: systems that contain their own copies of everything and systems that rely on network-based servers for critical applications. • Standalone Systems Self-contained systems are often referred to as standalone systems, or “thick clients. ” – These machines typically contain the OS, and local copies of all applications required by users of the system. – The installation of a standalone system will require more time than some other systems, because you have to load the OS, and all of the applications on the local disk. – Such installations can easily become multi-day tasks! 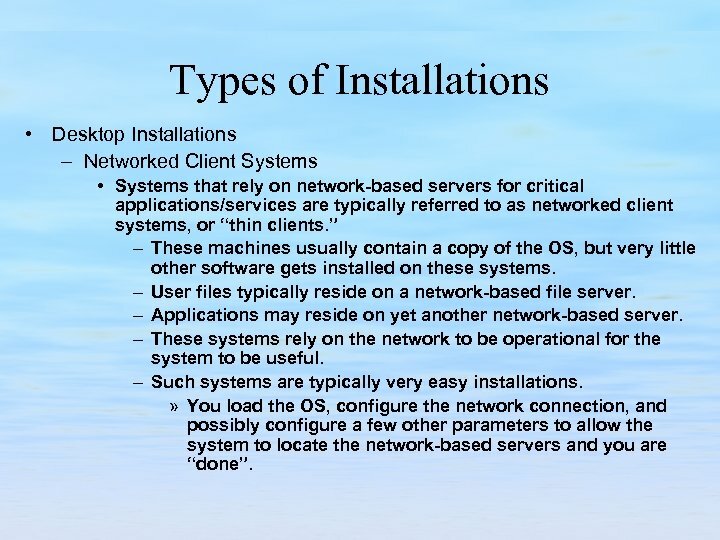 Types of Installations • Desktop Installations – Networked Client Systems • Systems that rely on network-based servers for critical applications/services are typically referred to as networked client systems, or “thin clients. ” – These machines usually contain a copy of the OS, but very little other software gets installed on these systems. – User files typically reside on a network-based file server. – Applications may reside on yet another network-based server. – These systems rely on the network to be operational for the system to be useful. – Such systems are typically very easy installations. » You load the OS, configure the network connection, and possibly configure a few other parameters to allow the system to locate the network-based servers and you are “done”. 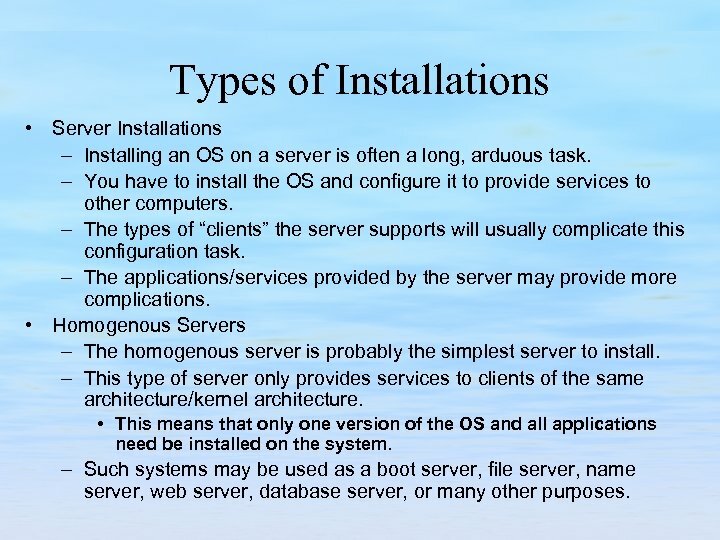 Types of Installations • Server Installations – Installing an OS on a server is often a long, arduous task. – You have to install the OS and configure it to provide services to other computers. – The types of “clients” the server supports will usually complicate this configuration task. – The applications/services provided by the server may provide more complications. • Homogenous Servers – The homogenous server is probably the simplest server to install. – This type of server only provides services to clients of the same architecture/kernel architecture. • This means that only one version of the OS and all applications need be installed on the system. – Such systems may be used as a boot server, file server, name server, web server, database server, or many other purposes. Types of Installations • Heterogeneous Servers – Heterogeneous servers are probably the most difficult system you will ever have to install. 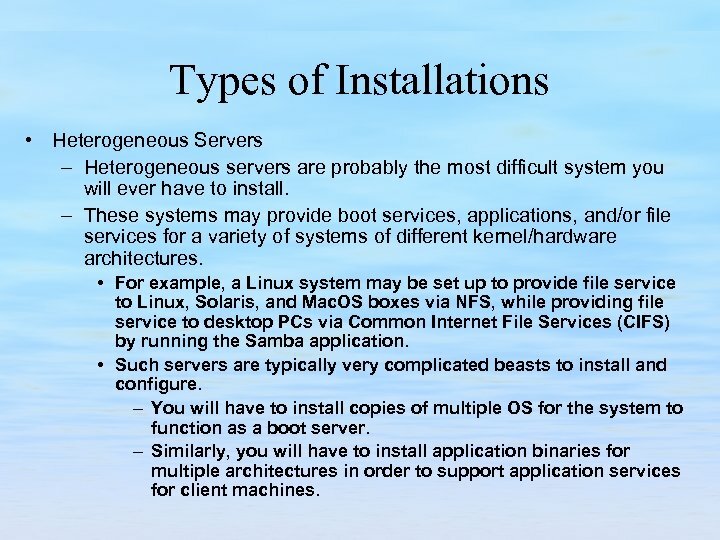 – These systems may provide boot services, applications, and/or file services for a variety of systems of different kernel/hardware architectures. • For example, a Linux system may be set up to provide file service to Linux, Solaris, and Mac. OS boxes via NFS, while providing file service to desktop PCs via Common Internet File Services (CIFS) by running the Samba application. • Such servers are typically very complicated beasts to install and configure. – You will have to install copies of multiple OS for the system to function as a boot server. – Similarly, you will have to install application binaries for multiple architectures in order to support application services for client machines. 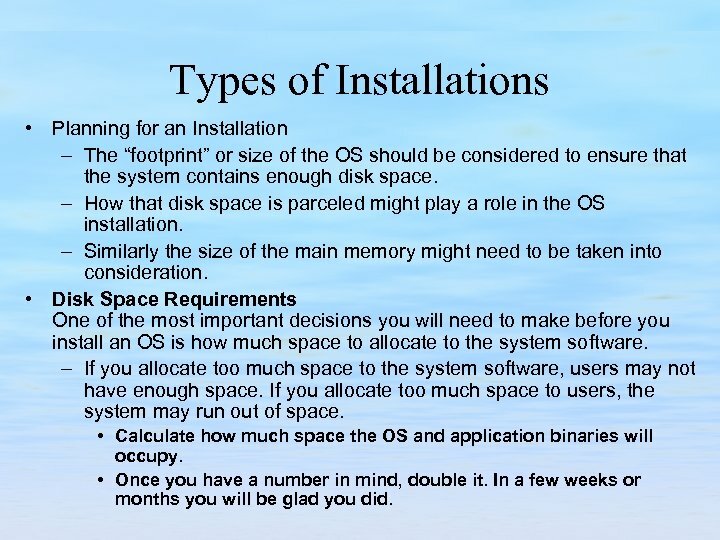 Types of Installations • Planning for an Installation – The “footprint” or size of the OS should be considered to ensure that the system contains enough disk space. – How that disk space is parceled might play a role in the OS installation. – Similarly the size of the main memory might need to be taken into consideration. • Disk Space Requirements One of the most important decisions you will need to make before you install an OS is how much space to allocate to the system software. – If you allocate too much space to the system software, users may not have enough space. If you allocate too much space to users, the system may run out of space. • Calculate how much space the OS and application binaries will occupy. • Once you have a number in mind, double it. In a few weeks or months you will be glad you did. Types of Installations • Every successive release of an OS is larger than its predecessor. – This is an important point to remember, because you may have to upgrade the OS on a machine two or three times over the lifetime of the hardware. 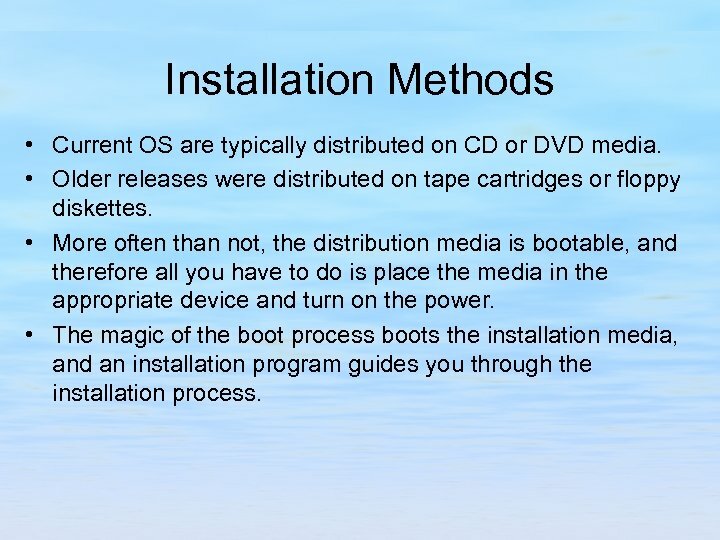 Installation Methods • Current OS are typically distributed on CD or DVD media. • Older releases were distributed on tape cartridges or floppy diskettes. • More often than not, the distribution media is bootable, and therefore all you have to do is place the media in the appropriate device and turn on the power. • The magic of the boot process boots the installation media, and an installation program guides you through the installation process. 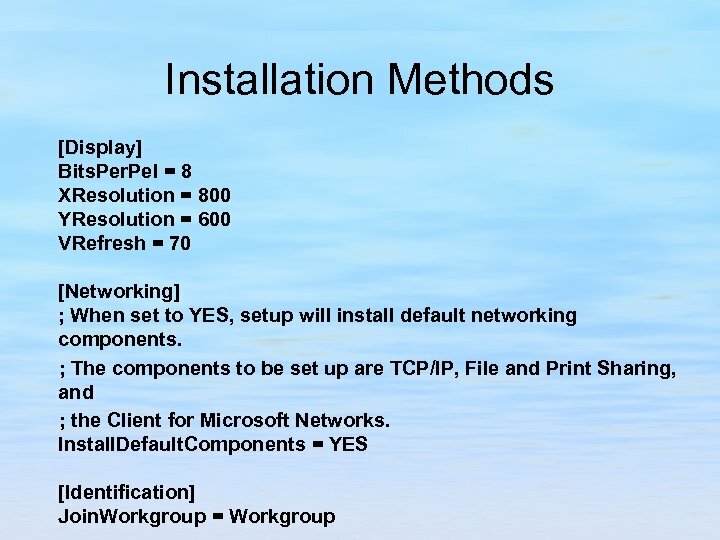 Installation Methods • Windows Installations – Most Windows installations give the administrator very few options. 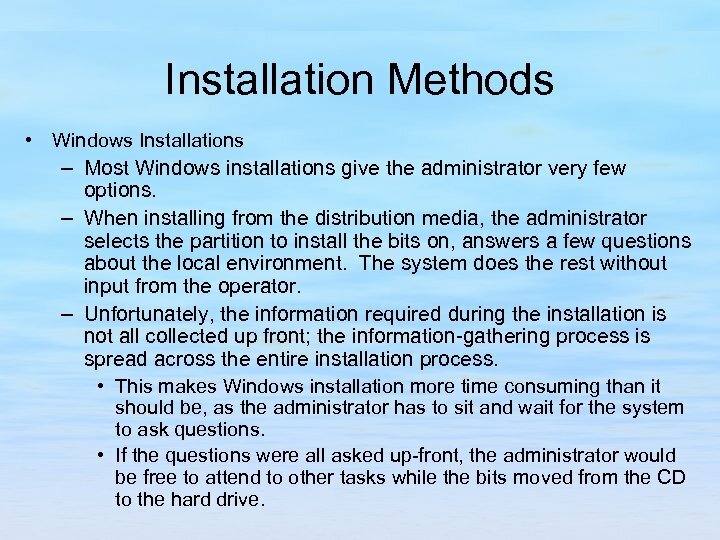 – When installing from the distribution media, the administrator selects the partition to install the bits on, answers a few questions about the local environment. The system does the rest without input from the operator. – Unfortunately, the information required during the installation is not all collected up front; the information-gathering process is spread across the entire installation process. • This makes Windows installation more time consuming than it should be, as the administrator has to sit and wait for the system to ask questions. • If the questions were all asked up-front, the administrator would be free to attend to other tasks while the bits moved from the CD to the hard drive. 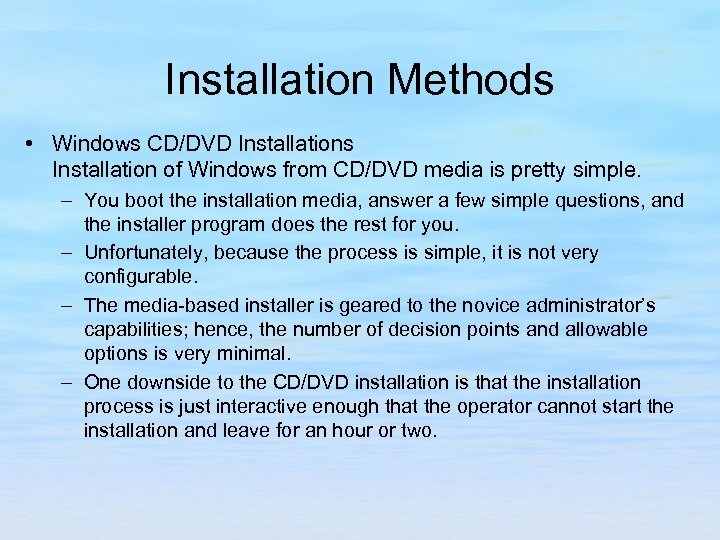 Installation Methods • Windows CD/DVD Installations Installation of Windows from CD/DVD media is pretty simple. – You boot the installation media, answer a few simple questions, and the installer program does the rest for you. – Unfortunately, because the process is simple, it is not very configurable. – The media-based installer is geared to the novice administrator’s capabilities; hence, the number of decision points and allowable options is very minimal. – One downside to the CD/DVD installation is that the installation process is just interactive enough that the operator cannot start the installation and leave for an hour or two. 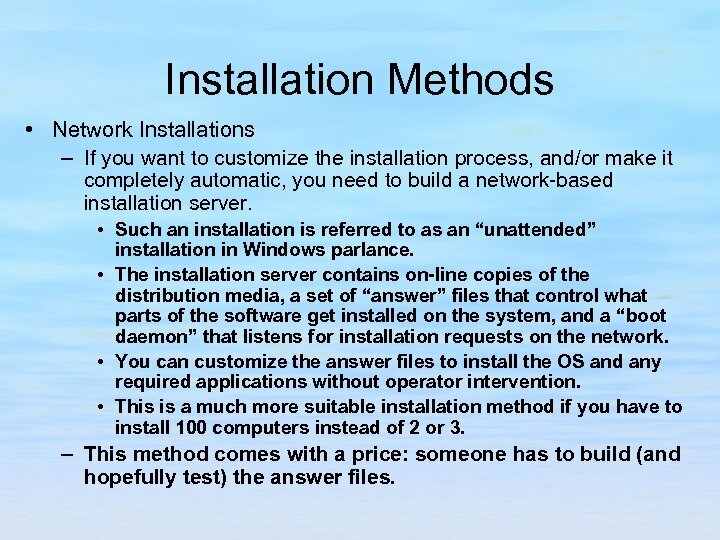 Installation Methods • Network Installations – If you want to customize the installation process, and/or make it completely automatic, you need to build a network-based installation server. • Such an installation is referred to as an “unattended” installation in Windows parlance. • The installation server contains on-line copies of the distribution media, a set of “answer” files that control what parts of the software get installed on the system, and a “boot daemon” that listens for installation requests on the network. • You can customize the answer files to install the OS and any required applications without operator intervention. • This is a much more suitable installation method if you have to install 100 computers instead of 2 or 3. – This method comes with a price: someone has to build (and hopefully test) the answer files. Installation Methods ; Microsoft Windows 2000 Professional, Server, Advanced Server and Datacenter ; (c) 1994 - 1999 Microsoft Corporation. All rights reserved. 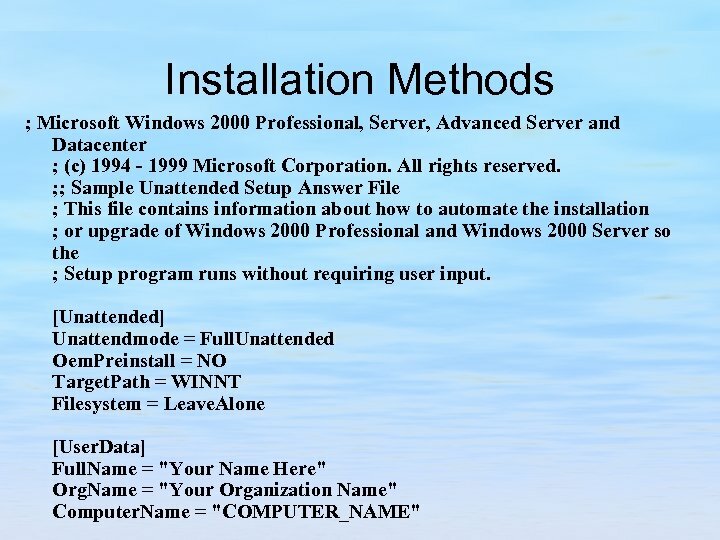 ; ; Sample Unattended Setup Answer File ; This file contains information about how to automate the installation ; or upgrade of Windows 2000 Professional and Windows 2000 Server so the ; Setup program runs without requiring user input. [Unattended] Unattendmode = Full. Unattended Oem. Preinstall = NO Target. Path = WINNT Filesystem = Leave. Alone [User. Data] Full. Name = "Your Name Here" Org. Name = "Your Organization Name" Computer. 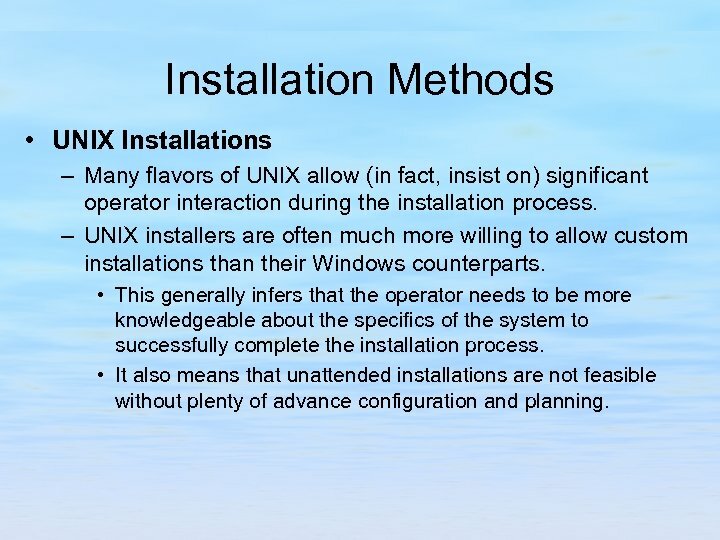 Name = "COMPUTER_NAME"
Installation Methods • UNIX Installations – Many flavors of UNIX allow (in fact, insist on) significant operator interaction during the installation process. – UNIX installers are often much more willing to allow custom installations than their Windows counterparts. • This generally infers that the operator needs to be more knowledgeable about the specifics of the system to successfully complete the installation process. • It also means that unattended installations are not feasible without plenty of advance configuration and planning. Installation Methods • CD/DVD Installations – As with Windows distribution media based installations, the installers used by UNIX OS are somewhat automated. • A difference between UNIX and Windows installers is that MOST UNIX installers ask all of the questions up-front, then use the answers to drive the remainder of the install. 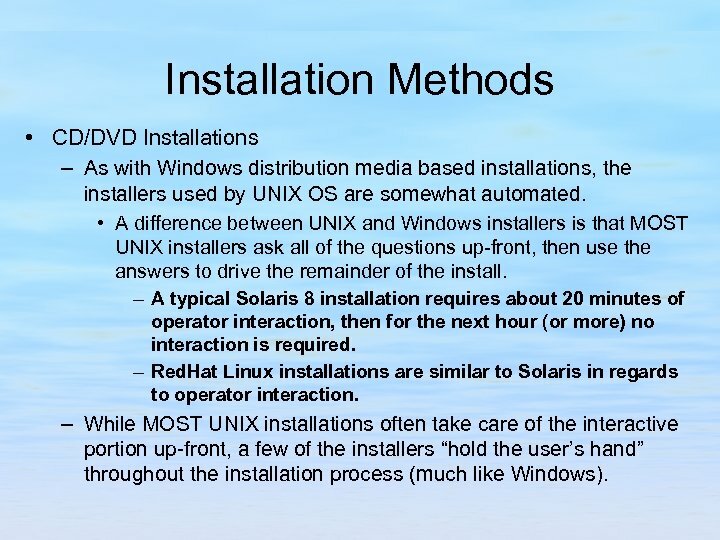 – A typical Solaris 8 installation requires about 20 minutes of operator interaction, then for the next hour (or more) no interaction is required. – Red. 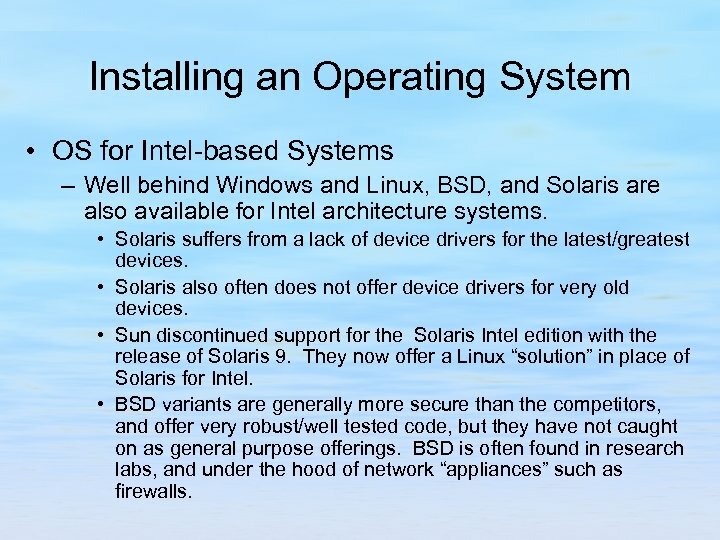 Hat Linux installations are similar to Solaris in regards to operator interaction. – While MOST UNIX installations often take care of the interactive portion up-front, a few of the installers “hold the user’s hand” throughout the installation process (much like Windows). Installation Methods • Network Installations – Most versions of UNIX support a network-based installation system of one form or another. 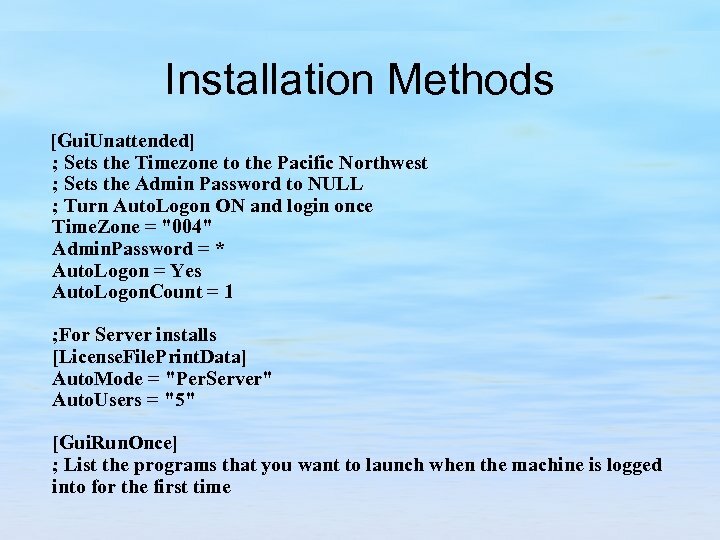 • Like Windows, these installers require a network-based boot server, rules files that dictate how the installation is performed, and a boot daemon that runs on the server to manage the process. – The Solaris Jump. Start package is one such network-based installer. – Sun’s Web. Start and the Linux Kick. Start service are other examples of the automated network-based installer. – Because there is no official standard for these networkbased tools, and each vendor has one (or more) of these installers, describing all of the current offerings is difficult, if not impossible. 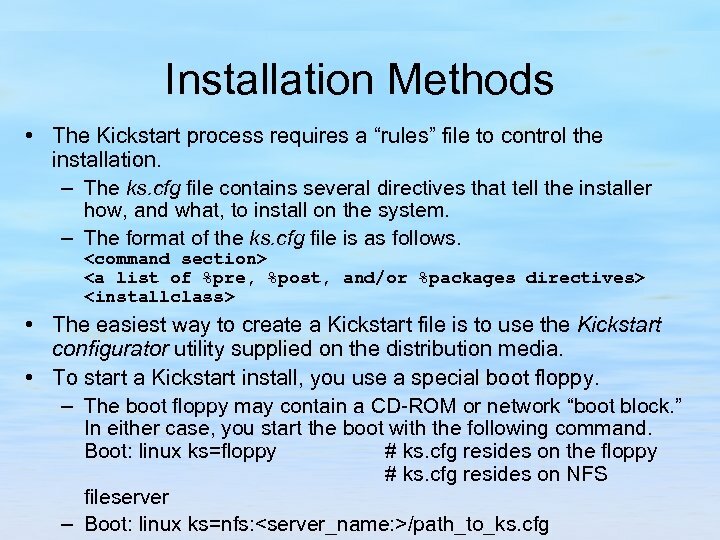 Installation Methods • Linux Kickstart – Linux may be “kickstarted” from a bootable floppy diskette or from a network-based boot server. • The floppy diskette must contain a configuration file named ks. cfg. – This file is the Linux equivalent of the Windows “answer file” for an unattended installation. • To perform a network installation, you need to have a DHCP server running on your network. 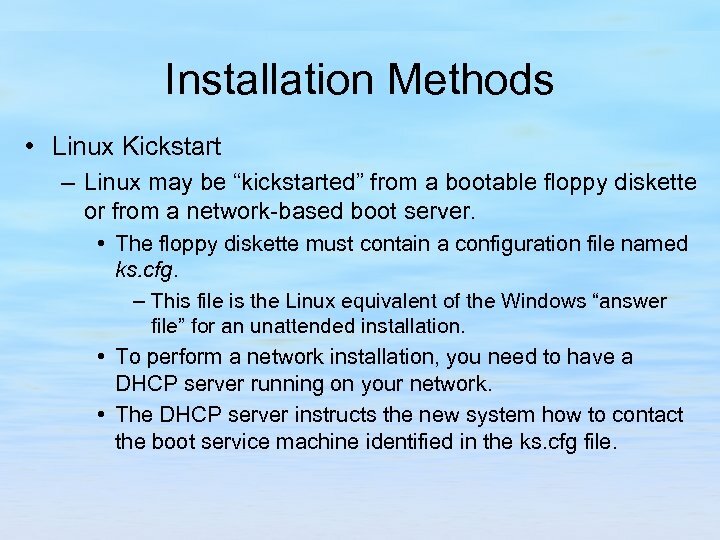 • The DHCP server instructs the new system how to contact the boot service machine identified in the ks. cfg file. 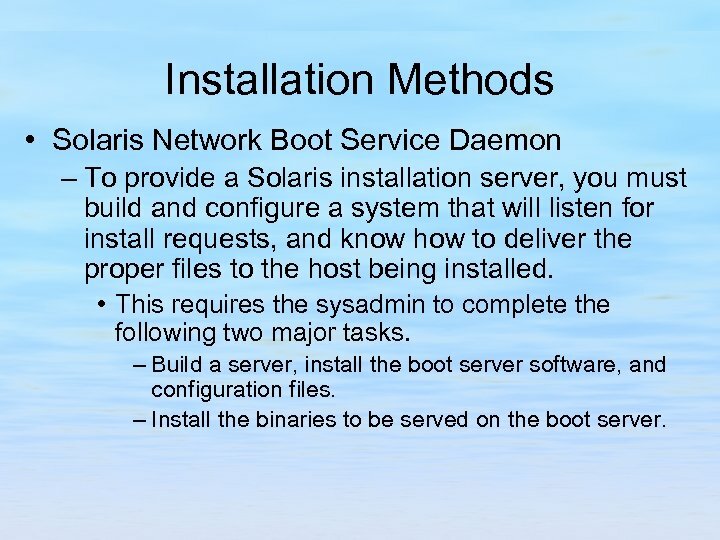 Installation Methods • Solaris Network Boot Service Daemon – To provide a Solaris installation server, you must build and configure a system that will listen for install requests, and know how to deliver the proper files to the host being installed. • This requires the sysadmin to complete the following two major tasks. – Build a server, install the boot server software, and configuration files. – Install the binaries to be served on the boot server. 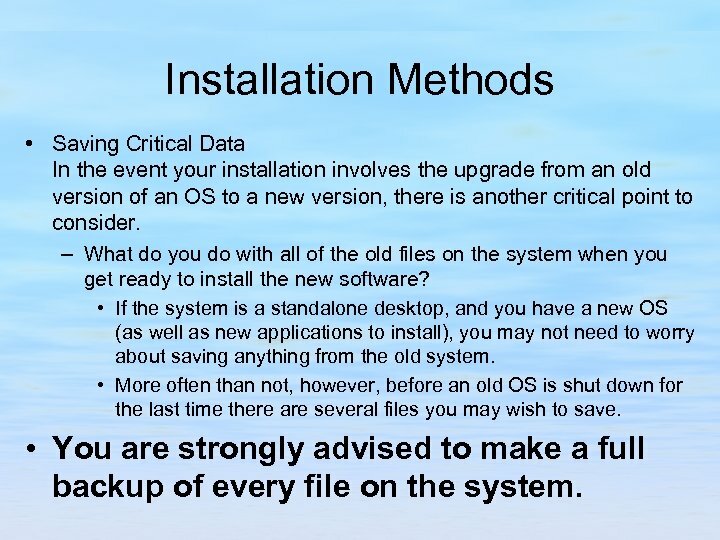 Installation Methods • Saving Critical Data In the event your installation involves the upgrade from an old version of an OS to a new version, there is another critical point to consider. – What do you do with all of the old files on the system when you get ready to install the new software? • If the system is a standalone desktop, and you have a new OS (as well as new applications to install), you may not need to worry about saving anything from the old system. • More often than not, however, before an old OS is shut down for the last time there are several files you may wish to save. • You are strongly advised to make a full backup of every file on the system. 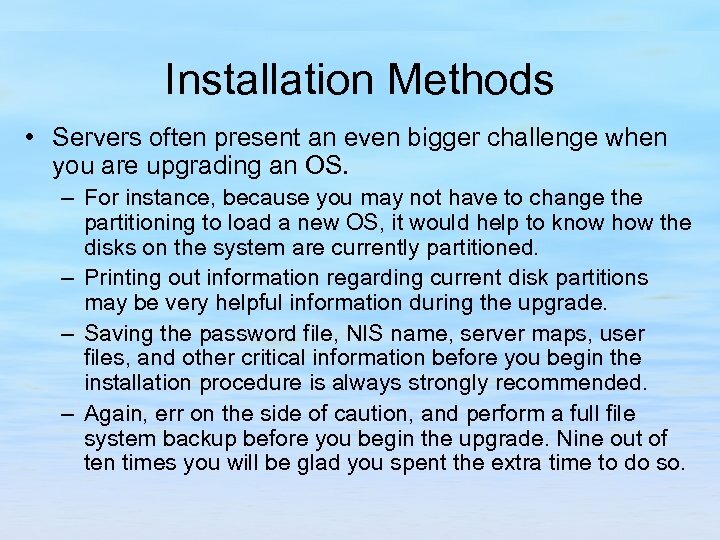 Installation Methods • Servers often present an even bigger challenge when you are upgrading an OS. – For instance, because you may not have to change the partitioning to load a new OS, it would help to know how the disks on the system are currently partitioned. – Printing out information regarding current disk partitions may be very helpful information during the upgrade. – Saving the password file, NIS name, server maps, user files, and other critical information before you begin the installation procedure is always strongly recommended. – Again, err on the side of caution, and perform a full file system backup before you begin the upgrade. Nine out of ten times you will be glad you spent the extra time to do so. Summary • Installing an OS is a huge undertaking. • There are no set formulas for how it should be done. • Early steps in the planning should include checking that the new software will run on the hardware. • Determination of the type of installation, homogenous server, heterogeneous server, standalone system, thick client, or thin client should also be addressed before beginning the installation process. • System types to be supported and the intended use of the system must also be factored into installation planning. • Application availability should be checked, and rechecked. 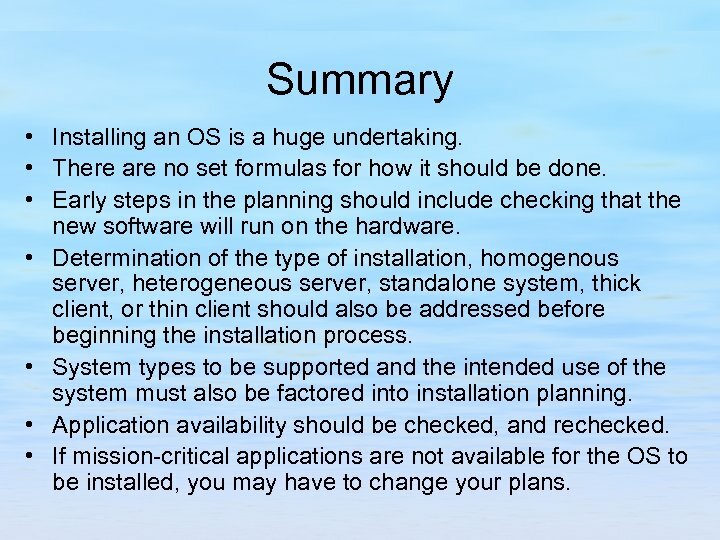 • If mission-critical applications are not available for the OS to be installed, you may have to change your plans. 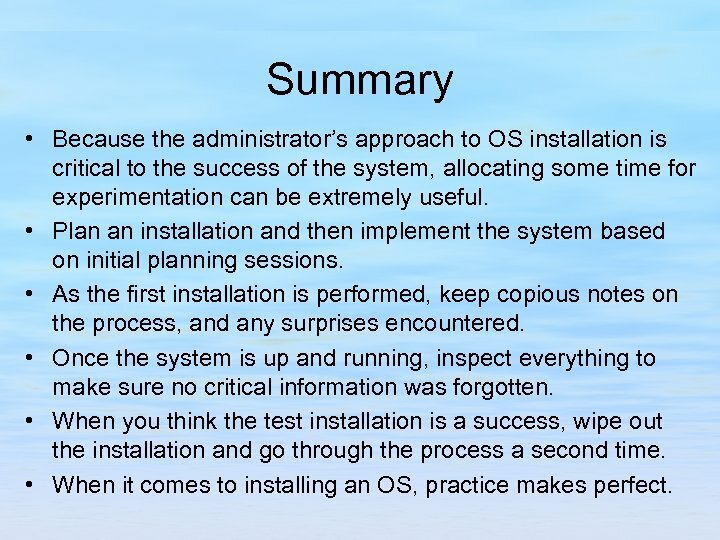 Summary • Because the administrator’s approach to OS installation is critical to the success of the system, allocating some time for experimentation can be extremely useful. • Plan an installation and then implement the system based on initial planning sessions. • As the first installation is performed, keep copious notes on the process, and any surprises encountered. • Once the system is up and running, inspect everything to make sure no critical information was forgotten. • When you think the test installation is a success, wipe out the installation and go through the process a second time. • When it comes to installing an OS, practice makes perfect. Copyright © Media. Tek Inc. All rights reserved.